Service Shifts in the Automotive Industry Are Driving Profound Change. Are You Ready? - Haig Barrett, Inc.
As the 2018 auto show season comes to a close, the Haig Barrett team and I are certain that profound service shifts in the automotive industry are not only coming; they are here. However, as we discussed the issue with many automotive industry leaders, we learned that there are different levels of preparedness in addressing these trends. As Haig Barrett’s suspicions relating to the industry’s service shifts and corresponding gaps strengthened, we decided to commission original research to learn more. Through the research, we learned that we were correct to be concerned for some important industry players. But the great news is that once gaps are identified, they can be closed. The reality is, there has been a pronounced shift away from the traditional business of selling vehicles and related ownership models to one of providing mobility-centric services (see Figure 1). 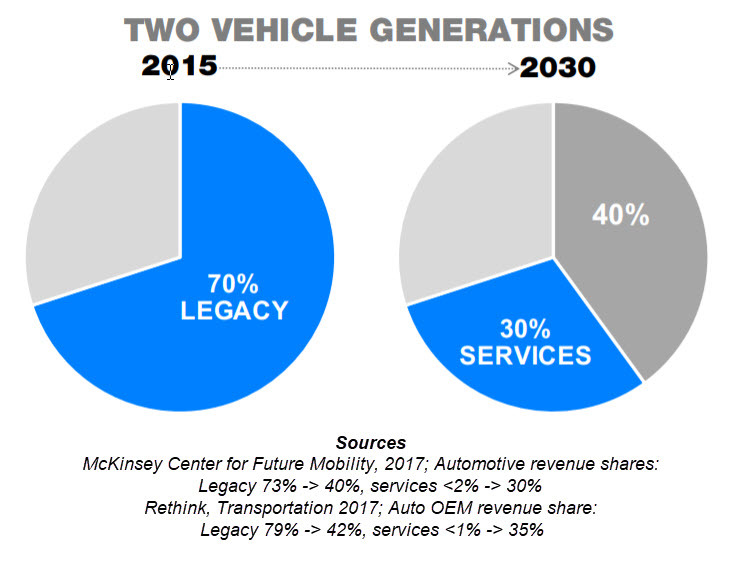 Meta-research reveals something that automotive industry leaders, analysts, the media, financiers, and investment bankers agree with; within the next two vehicle generations, nearly half of all revenue will come from the mobility services end of the market, rather than the sale of the vehicles themselves. This shift is significant, and for some it is concerning, because mobility services require very different business models. For example, facilitating subscriptions to automobile access is very different than an own-or-lease business model. A subscription business model, as just one example, requires different supply-chain execution systems, as well as different cash-flow cycles and key performance indicators. Through a synthesis of early work on digitization and its impact on the automotive industry, Haig Barrett came to understand that there is a growing chasm between automakers and their understanding of what is driving new markets and buying behaviors. This concerned us greatly. So we teamed with service experts and data scientists and created new data-science-based methodologies that can extract critical, actionable insights for automakers and span the disparity between product development strategy and meeting consumer demand. 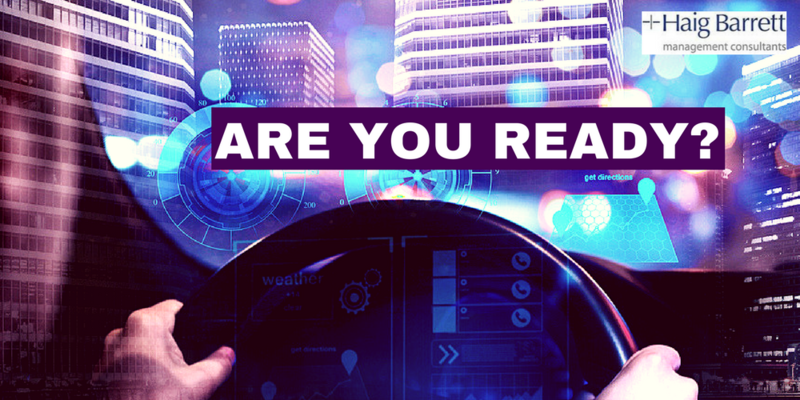 Our research identified Seven Critical Gaps (see Figure 2) that must be spanned for automakers to connect, engage, and sell emerging products, services, and experience offerings in a profitable manner to today’s tech-savvy customers. Though the Seven Gaps identify the challenges automakers face, fortunately, the path to success is being lit by innovators. However, for many automakers and other stakeholders within the value chain, the path with not be an easy or a smooth one—but it will be exciting and a lot of fun. Below we share with you a summary of the Seven Market Gaps our research identified, but we would love to share more. Get in touch (our contact information is at the bottom of this post) if you would like to discuss the full research results and/or discuss ideas for adapting your business to these changing times. For many, it has become common practice to search YouTube for “how to” advice on operating or fixing your personal technology, such as how to extend the life of a printer cartridge, how to jump-start a car, or how to reset the warning and service lights on your dash without going to the dealer. How many out there really read automakers’ owner’s manuals or consult with dealership staff on new features? Not many. Instead, customers learn about their vehicles through social media and brand/affinity support groups. Instead of being an afterthought in the marketing department, have engineering design tutorials and learning choices that would be designed into the vehicle itself. Gap-spanning leader: On the forefront is Tesla with its $0 traditional marketing budget. Mercedes is another example, offering its “Me” app as a vehicle “remote control” and social media driver in one. There will always be customers who buy vehicles for basic transportation utility, seeking a solid, economical vehicle to get them safely from point A to point B; Uber, Lyft, and autonomous-Uber variants present new competition for this buyer. Premium vehicle sales could be particularly threatened by these shifts. Nobody needs a premium vehicle to get from point A to point B anymore. Therefore, premium vehicles are transcending their traditional transportation roles, and automakers have been working hard to freshen up the product experience. For example, premium automakers continue to associate with halo, luxury-branded goods and high-dollar sporting segments (BMW’s thrust into global competitive yachting) and traditional “race on Sunday, sell on Monday” venues. Similarly, these trends are reflected in product development, adding horsepower and custom, personalized appointments or appealing to tech adopters and eco-conscious buyers with hybrid and electric platforms, and getting involved with racing. However, not all brands have the bona fides and heritage to authentically morph into a sports-car brand. Furthermore, few of us can test our mettle on the Nürburgring or other places where high-speed driving is done safely and legally. However, for most of us, driving is a mundane routine. To fight the monotonous and to prompt a premium brand purchase or lease will require creating the kind of lifestyle experience that is immersive and ultimately leaves a good and long-lasting feeling. Gap-spanning leader: Mercedes-Benz is expanding its lifestyle activities with Classic Centers, Classic Service and Parts, and beyond: The brand is indeed experimenting with coffee shops as physical places for their customers to see and be seen in. Lincoln, a pioneer in luxury-car branding, has also opened experience stores that include a coffee/snack bar. How to make life better and more convenient begs the question of how to make vehicles easier to use for average drivers. New benchmarks continue to come from outside the automotive industry. Smartphone applications such as Google Maps have been encroaching on the profit margins of onboard satellite-navigation systems and accessories purveyors for years. Even worse, these new navigation entrants may usurp the automaker’s customer relationship for upselling its own connected, telematics-based, remote customer- and product-support services. The latest challenge to the status quo include the voice-actuated user interfaces and new “skills” apps as they are termed, including Amazon’s Alexa. In February, Bloomberg reported that Alexa has passed the inflection point with the iPhone, becoming the “device” of the next decade. Gap-spanning leader: For $50, Anker’s Road Viva adapter allows drivers to use Alexa via a smartphone in the car. Hyundai was first to integrate Alexa with its Blue Link–connected car app. In “Kiss the Good Times Goodbye,” industry veteran Bob Lutz added another downer to his vision of doom and gloom for car dealers. The truth is indeed inconvenient at best. Dealerships are already facing tremendous profitability and retention pressures. All trends, from electrification to subscriptions to autonomous driving, have the potential to hurt dealership revenue streams and profit margins if dealers and automakers alike do not change. Electric vehicles (EV) don’t require oil changes, spark plugs, or transmission fluid; have fewer serviceable parts; and don’t require dealer visits for software or other updates. If this is not addressed, dealer traffic will decline. Subscriptions could have a compounding effect by further reducing traditional ownership—dealership traffic will decline even further. Toyota’s Gill Pratt 2017 Los Angeles Auto Show presentation offers a clear assessment: If robotaxis can reduce cost per mile by 40 percent, it would “turbocharge” subscriptions. With Waymo’s launch of its robotaxi service this year in Chandler, Arizona, the clock has started ticking. Gap-spanning leader: AutoNation has quickly teamed up with Waymo to service robotaxis. Why would any auto buyer pay more for less? Why deal with added complications? “Naked” EVs without charging solutions are better and cheaper. Premium households with high utility and power bills offer additional opportunities to subsidize EV ownership through home solar and battery solutions. Gap-spanning leader: Haig Barrett’s mystery shopping methodologies confirm that Tesla is setting the bar with its easy-to-use supercharger service and one-stop shopping for home solar and batteries. Mercedes-Benz Energy is following Tesla’s lead. Ride sharing, commuting co-ops, point-to-point versus free floating—it seems that currently anything goes. Yet subscriptions seem to be a path to success for other industries—Amazon Prime, Netflix, and Office 365, for example. Even airline rewards programs have evolved away from frequent flyer programs toward de-facto subscriptions with airlines rewarding people on dollars spent and not distance traveled. Gap-spanning leader: Cadillac launched its $1,500-per-month Book “brandsharing” service in 2017; Porsche Cars North America is following suit with Passport. A common observation regarding the character and effect of digitalization (and the technologies associated with it) is the potential product fragmentation and specialization that may result. Fragmentation and specialization often occur because digital technology reduces the delivery cost associated with obtaining better information. Better, more accurate, and empirically obtained data allow more strategic product planning—all the better to deliver targeted, tailored, one-to-one product and service offerings. This shift has been correlated with supply-chain fragmenting. For example, the aviation business has fragmented into airlines, airplane manufacturers, and aircraft-leasing companies. To provide a successful airline service, fleet and yield management are fundamental capabilities. Gap-spanning leader: Daimler Financial Services invested € 1.1 billion to acquire Athlon, a leading fleet management company in Europe. 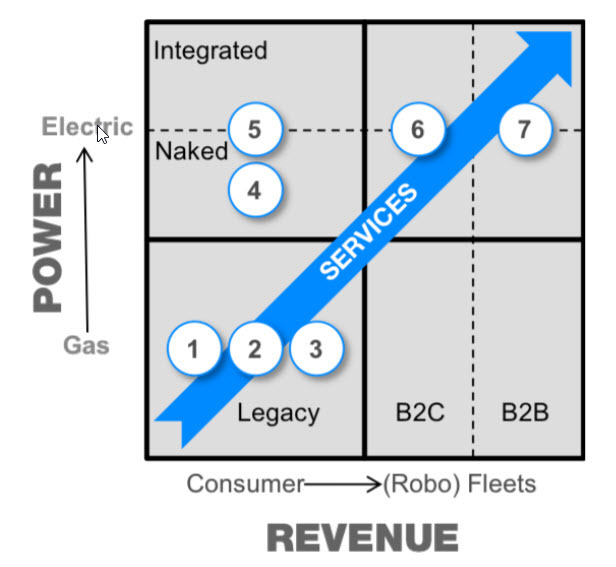 Spanning the gaps and entering the age of “Services 2.0” is absolutely data centric. Data and information are the needed currency for success and will help you achieve the most value from your product and services strategies reaching and retaining next-gen, information-age customers. Haig Barrett consultants and analytical staff are ready to help you access the innovative solutions you need to attain tangible results—from higher dealership profitability, higher JD Power scores, increased new subscription and retention rates, and the piloting of emerging EV-fleet strategies. Would you like to see the full market-gap research report? Would you like to discuss actionable ideas? Give us a call, or send us an email.